Your Smart TV is not actually that smart. IS PROCEEDING WITH TECHNOLOGY A RIGHT THING TO DO? Technology has surely taken a different turn, it is going to be more advanced in coming times. Technology has always been a maker and a breaker. No doubt, technological advancement has blessed us with smartphones, smart speakers, robots and more, but with all this comes the curse in the form of emerging hacking techniques and cybercriminals. One of such incidents that prove the curse part right came across. With Netflix, WiFi, YouTube on TV, everyone wants to own a smart TV but have you ever thought, is your Smart TV really that smart? According to a report by a new Consumer Reports Investigation, the smart TV installed in your house could become a medium for hackers to track your household’s personal viewing habits closely than you ever imagined. The non-profit consumer product testing organization inspected five of the top smart TVs on the market and the results were shocking. In some of them “a relatively unsophisticated hacker” could control the smart TVs remotely and conduct various pranks such as knock the TV off the Wi-Fi network, change the channels, increase the volume to irritate you. Samsung, TCL, and devices using Roku TV platform such as RCA, Insignia, Sharp, Philips and more were found to be vulnerable. This seems to be a very dangerous world. Technology furtherance can be a fascinating thing but it intimidates people to the core with all these aspects revealed now and then. WHAT IS ACR AND WHY DO TVS HAVE IT IN THE FIRST PLACE? “Automated Content Recognition.” or ACR helps your smart TV in suggesting you the content that you might like after keeping on eye on you and your tele-habits. Moreover, it is used to target your families with ads. In other words, it helps TV marketers and content creators to know what audiences want, or what kind of content will entertain you generating them the revenue. DOES IT REALLY POSE A THREAT? Once the report came out, many of the TV companies came forward and issued a statement against the report. A TCL spokesperson said, “customer’s privacy and security are always a top priority” and supported Roku. Whenever you install an app on your smartphone, it asks for your permission to access your videos, camera, contacts or other things for better functionality. Similarly, when the smart TV is initially setup, it asks for your permission to collect the viewing data with a warning if not allowed the access, the device will not be able to suggest the content that you may like. Most of us, agree to it without reading the whole terms and conditions as we are in a hurry to use our brand new Smart TV. This is a mistake that we as a user make. We can disable this function anytime we want. How about not asking for permission to collect data in the first place. If a user really wants the smart TV to show off the smartness and suggest the content that he may like, he will go and enable it anytime. Moreover, it should be very easy to disable or enable ACR and customer should not deal with different screens to do so. 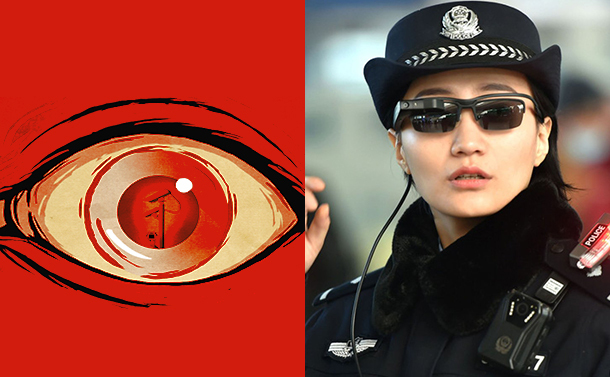 A new tool, facial recognition glasses is added to Chinese surveillance weaponry. WHAT IS NEW IN THE ARSENAL? Chinese officials boasted the latest addition to the surveillance arsenal: facial recognition eyeglasses. Each pair of these amazing eyeglasses has bleeding edge optics and advanced facial recognition algorithms which can help the officials find a fugitive even in most crowded places: airport, train station, beaches and more. The glasses are accurate and can identify the bystander in a few seconds. When the wearer looks in a direction where someone is standing, the camera on the glasses scans and takes accurate measurements of width and depth of a face and compares it with the criminal database. The device was out of testing last year and passed the testing phase with flying colors. According to the officials, during the test conducted at Zheng Zhou’s East Railway, the glasses were able to identify seven wanted people in major cases. Moreover, it was able to point out 26 other passengers who were traveling with a false identity. IS SUCH EXTENSIVE SURVEILLANCE EVEN REQUIRED? No matter how futuristic the Chinese government has been with this latest tech, but the perturbing question that lingers is – is it really the need of an hour? Or is it just another way of China telling people of the country that they live in communist nation? There is no doubt that this latest addition to the weaponry is very helpful as it is definitely an amazing and portable replacement to the fixed-position units at huge transportation center, other important and crowded places. Due to the mobility issues, fixed-position facial recognition devices have a lot of disadvantages. However, this technology is really not needed. As there are neither swarming groups of criminals freely moving in the country nor the people of the country ave revolted against the ruling party. This seems to be a mere act to prove them supreme. DOES THIS PROVE THE CHINESE GOVERNMENT’S AUTHORITARIAN NATURE? China has world’s largest surveillance camera circuit. Its constant obsession with keeping people of its country under its surveillance is exasperating. China uses the dragnet approach and adds both suspects and citizens to a database. Due to which, they can identify anyone, living or breathing. What an autocracy it is! Now with the glasses, the whole population is under surveillance of the officials. Looks like there is no privacy for the Chinese people. Imagine how difficult it is, to live in a country where your every move can be watched and monitored.